These pages provide access to Oceanographic time-series measurements made by the U.S. Geological Survey between 1975 and the present as part of research programs. 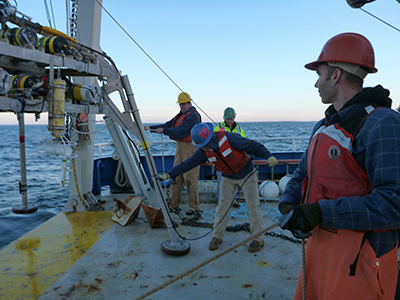 The data were collected to address specific research questions and were primarily collected over durations less than a year, using stationary platforms, with sensors near the sea floor. Some of the measurements span the vertical extent of the water column, but others are limited to the area less than 5 meters above the sea floor. These data have been used to study of ocean dynamics and to validate coastal ocean models. All the sites at which oceanographic or water quality measurements were collected by our program are shown on the interactive map below. Platforms from an Experiment all use the same icon (legend at bottom). Click on the icons to display the Experiment name, platform ID at that site, and the deployment dates. The "Experiment List" tab may also be used to select Experiments. Map Instructions.